Repair or Replace my Fridge? It is hard to ignore something you depend on daily. When my friend’s refrigerator stopped working and decided to take the plunge this last week, they discovered that the refrigerator stopped cooling when taking their butter out of the fridge. It was completely soft. Within an hour the fridge was no longer cool and the freezer was warming. She quickly went into action to save their food from spoilage. 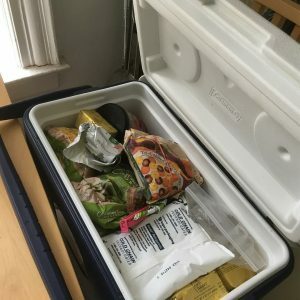 She pulled everything out and put into a cooler with ice and her husband bought more ice on his way home. They called their landlord, who is a little old lady, 84 years young and told her that their refrigerator not cooling properly (actually that their refrigerator stopped cooling). 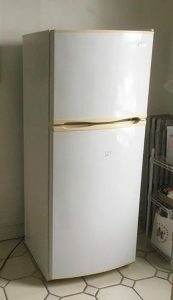 The landlord opted to not even have the fridge checked out, but bought a new one and had it delivered. I should add they live in New York City, so picking one up and hauling it yourself is almost impossible. When the new fridge arrived, the old one showed a few signs of life, but time of death was called on this old fridge, not even giving it a second thought. Her landlord then tried to explain to my friend and her husband that they need to shut the fridge door completely, like they don’t know how to properly use a refrigerator! Their old fridge was definitely passed its prime, and the new one should have a life time of roughly 14-17 years. Some easy ways to help maintain your fridge, so it stays in working condition by CNET are: Clean the condenser coils, setting the temperature between 37°-40°, if it is set too low, the fridge will work overtime and possible freeze up. Not leaving your fridge empty, if there is nothing in your fridge to cool, the fridge works harder to maintain the temperature. If there are plenty of items in your fridge, these items will hold the cool temperature and help maintain it. Allow space between your fridge and the wall, this allows air flow around the fridge to help it from getting too hot. Also make sure the seals on the doors are working and not breaking up. This will ensure the cool air is staying inside your fridge and you are not cooling your kitchen at the same time! When is it time to call in a professional? Well for me, that any time I am unsure about the situation, other people may be a bit more ‘handy’ than I am. If my ice maker quit making ice, I’d probably live without ice and not worry about it. They make trays to make ice! So that would be my quick and easy solution. If my fridge quit dispensing water, I’d probably just use the faucet in my sink. I am resourceful that way! If the seals were damaged, I know I can replace those pretty easily, but if my fridge isn’t cooling or having frost build up in my freezer, I’d call in a professional and try to avoid DIY. I’d put a call in to my home warranty provider and have them send a service person out to take a look. I know my service call fee is only $75 and that is worth not having all the food in my fridge or freezer go spoiled. Usually we have several hundred dollars worth of food in each! There are ways to keep your appliances from breaking down, but unfortunately, they sometimes break down anyway. I have a new fridge, so I would definitely try and repair my fridge before replacing it. In 10 years, if something happens to my fridge I will more than likely just replace it, rather than even attempt to repair it. Much like my friend’s landlord in New York. She probably knew the fridge had come to the end of its life expectancy, and she opted to just replace the fridge. If the estimated repairs cost more than it would be for a new fridge, I would also opt to replace my fridge. If my fridge was brand new, most everything should be covered by the manufactures warranty, but after that coverage has expired its best to have a home warranty to cover the repairs or replacement of the appliance. It generally can cost less than $1 a day to cover all the appliances in your home.